This academic year, Voices of ECRs focuses on PhD holders who are now working outside traditional academia. Our sixth interviewee is Nimisha Barton who graduated with a PhD in modern French history from Princeton University. 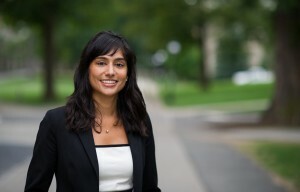 After her viva in April 2014, she worked part time at the Office of Development (Princeton) and is now Associate Director of the Freshman Scholars Institute and Programs for Access and Inclusion at Princeton University. In this interview she explains how she transitioned from traditional academia to higher ed administration and obtained a job that combined widening participation with her research interests on migration and gender. You can find out more about her work here and on the University of Princeton website. My research concerns gender, sexuality and immigration in modern France. I can’t think of any other way to describe how I arrived at this field except to engage in some brief autobiography: my mother came to the United States from India in the 1970s; she married the man who would raise me in the 1980s; he is a white man from Chicago who never went to college; and I was the first in my family to ever go to college, certainly in the US. In other words, I am the product of an immigrant household, of a mixed marriage, and I know what it’s like to try to gain access to a world that was not made for you. These experiences shaped my research interests and my current professional work: namely, how do outsiders become insiders? What policies and practices exist to facilitate or obstruct that process? And what is the world that they exist in? I submitted my thesis in March of 2014 and defended in April 2014. In those months, I met with a wide range of mentors in various academic and administrative fields to try to think through what came next. I have always been self-supporting and, though I had savings, my immediate concern was to secure paid employment, quite frankly. I was clearly most suited to jobs in the academy and so I found it easiest to simply adjunct at local colleges in the area. Through my discussions with fantastic mentors and a series of women who took an active interest in my personal and professional success, I began to broaden my horizons and think about the possibility of jobs outside of traditional academia. I was very drawn to work in the world of non-profit, particularly work centered on the rights of women, migrants and families. I was also, of course, well-suited to jobs in higher ed administration, particularly jobs related to what I was passionate about: women, gender and sexuality; diversity in higher ed; and issues related to first-generation and low-income students. Needless to say, I had a personal stake in each of these fields. In the world of non-profit, I realized that I could leverage my very strong communication and writing skills for a number of different positions. But it came as a big surprise to me that I would need to spend considerable time networking and building relationships in order to really be considered for any positions in those fields. I would also need to gain actual professional, office experience in order to be taken seriously. I was fortunate to be offered a part-time position in the Office of Development at Princeton University (fortunate because senior women working at the University created the position out of thin air for me because they knew I was in need of professional assistance). The fit into higher ed admin job was a bit easier since more and more PhDs are getting jobs in administration these days, but it did nevertheless rely on networking and building out relationships with folks at other universities. The single greatest challenge was highlighting the skills I DID have as a result of the PhD process (namely, strong reading, writing, communication and critical thinking/problem solving skills). I had to learn to “translate” an academic CV for a lay audience. In other words, it is not immediately apparent to anyone outside of academia that we have any skills that are useful in the “real world.” That is an argument we must make and we must make it in a compelling way. Secondly (and here I’m luckier than most), I needed to acquire hard skills in an office setting and a number of professional experiences that I could speak meaningfully about in an interview. My stint at the Development Office was very useful in this regard. It is also important to have office experience of some sort because it resolves the “9 to 5” concerns that some employers might rightly have about graduate students: in other words, can this academic who has been so used to controlling his/her time really conform to the demands of the professional world that operates according to different norms and expectations? Thanks to my time in Development, I showed them that I could. Finally, networking, networking, networking! Folks think this is a dirty word, but the truth is academics do it all the time. From my perspective, I just thought of it as meeting interesting people, asking them questions about their lives and life choices, and then thanking them for their time. In short, building a relationship and then fostering that relationship. I love to keep in touch with the folks that I met during the year that I was job hunting, even though there is no possible “gain” that can now accrue to me. They are just good, kind, and fascinating people and I am lucky to have met them. Could you tell us a little about your non-academic career so far and your current job? What are your main responsibilities? How does a typical week in this job look like? I am the Associate Director of the Freshman Scholars Institute and Programs for Access and Inclusion at Princeton University. My main responsibilities include program development, management, implementation and oversight; and mentorship of first-generation, low-income students. There are three programs that I am responsible for: the Freshman Scholars Institute (FSI), a 7-week academic bridge program for first-gen/low-income students; the Mellon Mays Undergraduate Fellowship Program, a national fellowship program for URMs that seeks to diversify the ranks of the professoriate by recruiting and supporting talented, high-achieving undergrads looking to pursue a PhD; and the Scholars Institute Fellows Program (SIFP), a 4-years scholars program for first gen, low income Princeton students that I had the great privilege to design, launch and now manage and oversee. The vast majority of my time is spent on SIFP. I am responsible for program design (what does it look like to be a participant in this program? ); program development (how should this program evolve and why? ); program implementation (given our goals, what will it take to run this program? Relatedly, who should I hire, oversee, and direct? ); program management and oversight (now that the program is running, how do I make sure that it’s all going according to plan? Who do I need to meet and collaborate with in order to ensure its ongoing success?). I am always looking for ways to make the experience of first-gen, low-income students at this elite institution better and I am lucky to have so many great colleagues to work with in order to do it. I am proud that SIFP has attracted over 300 students at Princeton University, nearly 10 percent of the student body. In order to provide them with the SIFP experience, I provide high-touch mentorship to them all: advice and guidance on nearly every facet of their academic, personal and professional lives. It’s an opportunity for me to provide what I was so fortunate to receive from my own mentors. Through my role, I continue to run biweekly academic workshops on the independent research and writing process to 25 upperclass students who work as student leaders in SIFP. I also run a similar series on post-graduate life that centers on career exploration, preparation and launch. Every week, I also develop and lead co-curricular workshops that are intended to provide all students with academic, professional and life skills. For instance, I run workshops on “How to Speak Prof-o-saurus” (to help first-gen, low-income students feel more confident in their interactions with what they often view as cold, distant authority figures) or “Mentorship 101” (explaining how to go about assembling a team of mentors for all aspects of life and then how to cultivate and nourish those relationships). I also run many “How to Write A ….” Workshops for personal statements, resumes, CVs, research proposals, cover letters, etc. Finally, in the wake of a troubling election, we offer sessions with immigration attorneys for our undocumented students who need a space where they can receive advice and support on navigating the citizenship process. Other life skills workshops might center on mental health issues, financial and budgeting skills, etc. Talk to people, learn more about the different fields that are out there, and network like it’s your job!